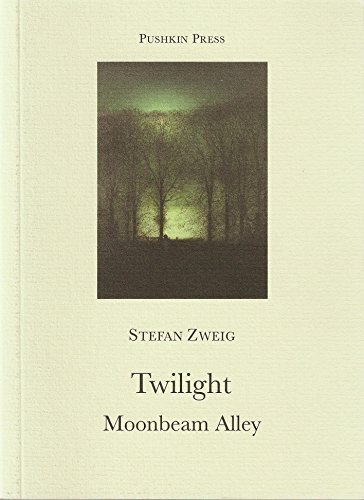 This little book contains two stories by Stefan Zweig, a 20th-century German author I'm very pleased to have discovered. The first story, "Twilight," is an imagining of the real-life downfall of Madame de Prie, a lady-in-waiting at Versailles, after the king banishes her from court. In the second, "Moonbeam Alley," a traveler is drawn into the tragic lives of a couple he meets in a tavern in the waterfront district of a foreign city. The stories are strongly reminiscent of Isak Dinesen's stories--moody, old-Europe settings and tales-within-tales wherein the main character meets someone who ends up revealing his life story. Loved these. I've never heard of Zweig but this looks very intriguing. I'd never heard of him until a German acquaintance suggested him when I asked about German literature. I'll be looking for more by him.